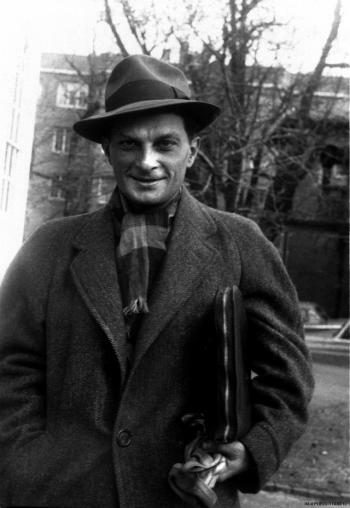 Stanislaus Ulam was a Polish mathematician recruited to the Manhattan Project in 1943. Ulam worked on hydrodynamical calculations that were crucial to the design of the implosion-type weapon created at Los Alamos. After the war Ulam collaborated with fellow Manhattan Project scientist Edward Teller to create the design for the hydrogen bomb. In this interview Ulam discusses the challenges of performing the equations needed to design a nuclear weapon without the help of computers. He also explores the ongoing tensions with his former partner, Edward Teller, over the origins of what has come to be called the Ulam-Teller design. Finally, Ulam reflects on the legacies of the both the Manhattan Project and the numerous scientists who made it possible. Rhodes: Yes. And use the library because many of the papers – many of the papers that are declassified are not available through the Department of Energy. They won’t give them out. I think it’s because of that Howard Morland book about the H-bomb. So even though they can be read by civilians they can’t be found by civilians unless we come here. So I thought I would work there. But it would be wonderful to see more of you. Ulam: Yes. I’ll be there probably tomorrow. I go there three or four times a week. Rhodes: Is Carson Mark still around? Rhodes: Because I understood that he is someone I should talk to. Ulam: Oh absolutely. He has very good memory of what happened. Ulam: Absolutely. Yes. More colorful in which way? What kind of color? You know, there was – a joke. There was a young lady whose name was Rose. I told her well now she should have her name called Zimbabwe. Rhodes: Yes. [Inaudible] were descended from the original Cecil Rhodes he made a great deal of money over there. Rhodes: As far as I know unfortunately not. One of the things that I found very useful – the book that I am working on is already 275 pages along, which takes it to 1932. It is a very long book. Ulam: Do you have another 500? Rhodes: Yes, that’s right. I spent some time trying to write about those early Hungarian years for [John] von Neumann and [Edward] Teller and [Leo] Szilard and [Eugene] Wigner, all four. This very much helps by your discussion by the Carpathian phenomenon. Ulam: Oh yeah, I have many discussions on that. Rhodes: Yeah, which he sort of seems to have failed to notice, too. Ulam: He was amused by it of course, you know, different people – Wigner is very old man now, but he has his political views. I would say rather extreme, like Teller but differently. Wigner I don’t think has his own personal career in mind at all. Teller, obviously, is influenced by the desire to advance his political career. Rhodes: And yet they are both very conservative politically it seems. In fact, and so was von Neumann, was he not? Ulam: No. Well he was more centric perhaps a little towards the right. Teller was too, but he felt more favorable for advancement of his career to [inaudible]. Ulam: There was a evolutional. Rhodes: But it was the [Miklós] Horthy regime. Ulam: That came after the communist. Rhodes: It was far more anti-Semitic. Ulam: Horthy was? Yes, but it so happens that they are all of Jewish descent. And I think Teller’s mother was in Hungary during the war. Rhodes: That’s true. He had some family people there during the war and after the war too, especially, during the communist years. Ulam: No, now I meant during World War II. Rhodes: Yes. But they were there also after the war when he was working on the H-bomb. Ulam: Talk about any possible suspicions as well. I don’t know. Rhodes: Did you find anti-Semitism in the United States when you came here? Ulam: No. There was perhaps a little socially more dissident and prejudice against exclusive clubs, not a Jewish member. Rhodes: But not for employment, for example? Ulam: For employment I never noticed that. Rhodes: You went to Wisconsin? Ulam: Well first I came to Princeton to receive an education [inaudible] for a few months. Then when I was there I had sort of a lucky accident. I ran into George Birkhoff and actually he knew about me from [inaudible] about my age. And after that I came to Harvard. I was at Harvard for four years. Rhodes: Well you did the junior fellowship? Ulam: [Inaudible] and then I became a University Professor. Rhodes: I was curious because when I talked to Dr. Wigner he went to Wisconsin for a very short time and he married there and then his wife contracted cancer and died. Sad story. Rhodes: I think that was at the same time. He was married for one year to an American girl and she died and then he eventually went back to Princeton. Yeah, that seems to be the same time. Ulam: During the war, I don’t know where he was before. Rhodes: He was at Princeton for a while. Yeah. They brought him over with von Neumann. Ulam: I know. When I came to Madison [Wisconsin] he had just left. Ulam: I came in 1941, I think. He was in ’40 maybe. Rhodes: Okay. I just wondered if you had been there together. Ulam: No. And another physicist, very well-known from Yale, Gregory Breit, just left and I was asked to give a course of his. And then I had to do another one so I did it. Rhodes: Where did you pick up all your physics? Ulam: Well, by myself. I was a very theoretical physicist [inaudible]. Then of course up here I had to apply more critically. Probably mentioned it in the book. Rhodes: Yeah. Were [J. Robert] Oppenheimer and Teller in some ways similar characters do you feel, in terms of their scientific work for example? Ulam: Well, in terms of scientific work neither was of the same extreme [inaudible]. Rhodes: That is one of the mysteries to me. Not mystery to me in the sense – it is mysterious that Oppenheimer is so routinely cited by others, [Hans] Bethe for example, as their intellectual superiors and yet we are not really their creative superiors. Ulam: No, not at all. Rhodes: I asked Bethe that and he said there was a difference, Oppenheimer knew everything. Ulam: He meant socially almost. Ulam: Culturally, yeah. But to me he was not terribly strong either. He had this intimate knowledge and a few other things. I don’t think he was comparable to von Neumann in his knowledge of ancient history or literature. He had a more sort of attentive, poetic balance—Oppenheimer. Teller was of course educated and so on but I don’t think he has any special—Teller is very ingenious but more in a sort of engineering way. And actually, he is very strange psychologically [inaudible]. Oppenheimer realized that he had no great original thought. [Inaudible] tragedy. Ulam: But differently. Oppenheimer was not directly involved in technology. Oppenheimer was fantastically quick and critical in understanding the theory. People who don’t really understand very well had only [inaudible] both of course [inaudible]. It is almost impossible to describe [inaudible]. Rhodes: No, it’s the nature of writing also. I understand what you’re talking about. Ulam: Men like [George] Gamow who had very little technique and yet somehow simple common sense and originality and Teller felt he wanted to be like that and his talents with other critical [inaudible] with the understanding trying to change things, but just a little [inaudible]. Rhodes: I understand. I spend a great deal of time in the first part of my book talking about Ernest Rutherford’s work. It is fascinating. A lot of it is luck although he made the luck and he got credit for it. You attended the 1946 conference on the Super? Rhodes: Can you say anything at all about what happened? Ulam: I don’t know how much is still classified. Ulam: Well let me try and remember. Ulam: Yes and some attempts to start calculations on computers even, already. Rhodes: These were the thermodynamic calculations? Ulam: Everything. For the Super bomb. You could call Carson Mark because I saw him yesterday. I hope he is still here. He goes to Washington. Rhodes: You mentioned in your book that at that conference, the Super conference, von Neumann and Teller were discussing changing the weather. Was that simply a curiosity? Or was it an extension of the weapons discussion? Ulam: No. Not at all. Rhodes: Just a possibility of the computer? Ulam: To understanding weather. Von Neumann, of course, was very much interested in meteorology and [Enrico] Fermi was. I remember I had a discussion during the war perhaps, with Fermi about is the gulfstream stable relative to its energy or could a small amount of [inaudible] change the whole world, situations economically. Just idle questions like that peaked our curiosity. Von Neumann probably initiated this conversation of applications and semantics and the possibility of computers to advance our understanding. Rhodes: Was Teller in any sense clearly the leader of the conference? What was his position in terms of what he developed later? Ulam: He was, I forget whether he was still at Los Alamos or whether he was already in Chicago. Rhodes: I’m not sure, but I can check. Ulam: Well he was the proponent, yes, of the Super. Of course, during the war already. Rhodes: Was it his conference? Rhodes: Is Bradbury still around? Rhodes: I talked to him some years ago. I should go up there tonight. Ulam: You have reservations at a hotel? Rhodes: I stayed at La Fonda’s just to see what it was like. Ulam: There are a tremendous number of tourists. I was in Los Alamos this morning but I was coming back and so many people have moved and traffic was enormous. Ulam: I was coming back. Rhodes: There’s a quote in the book that I wanted to ask you about that relates to this. Ulam: Well you really were very kind. Rhodes: I thought your book was wonderful. That was before I knew anything whatsoever about the whole subject too, which was—the two books together. The Teller biography was awful. Ulam: Written by two guys. I don’t know who did it. Rhodes: And yet there is more information than there is anywhere else about Edward Teller he’s been a very secretive man all this time. Ulam: I haven’t really read the book. Rhodes: You’ll see many things that will make you wince. For example, they thought that was a uranium bomb at Trinity; that is how illiterate they are scientifically. Still in all there are things there so. Ulam: Teller now is very active politically but now he managed to get the ear of Reagan. Rhodes: I’m also working on a story about him for the Atlantic monthly right now and he really does seem to be the person who convinced [Ronald] Reagan to go public with the Star Wars business. If Reagan thinks of defending yourself—this is an obvious and trivial thing, especially since he just listens to his advisors. Rhodes: Yes! Well in this case, he didn’t listen to his advisors; he listened to Edward Teller. Ulam: Funny thing, I don’t know if you noticed it. I was in New York visiting some biological [inaudible] and I saw a page one of the New York Times little [inaudible] of Teller receiving some— oh you saw that? And then there was an ad. Rhodes: Defending himself, but also making it sound as if he casually mentions to the president about all these different defense systems. Oh, wonderful. Let’s tell the public. It almost sounds as if Dr. Teller himself personally brought all of this on. Rhodes: That is what Teller wrote so it is very interesting. Since part of Reagan’s interest in the whole defense business is to come from Joseph Coors and the Heritage Foundation and so forth. Ulam: Oh is there an English word, tragic humorous? Rhodes: Tragic comedy [laughing]. Bathos is the English word, I think. Ulam: Bathos, yes. And pompous. Rhodes: This is the period toward the end of the war at Los Alamos when Teller was having problems with Bethe. Ulam: Well not so much problems as a little disaffection and he [Teller] wanted to do some other approaches. Rhodes: This is the paragraph you wrote that I am curious about: “But even then before the success of the atomic bomb itself, some of Teller’s actions gave clues to what led to much of the unpleasantness and waste of time in the so called H bomb controversy.” I’m curious about what those were. Ulam: Well you can ask Bethe. Rhodes: He’s here? I talked with him last year. Ulam: He is in Los Alamos I think. I can find out if you want. Rhodes: I have already interviewed him so there is no need. Ulam: He could tell you that as much as he can—whatever is not classified. Rhodes: Was it just something that you were aware of and noticed? Ulam: Oh yes, everybody did. Rhodes: Teller was eager to push the H-bomb? Ulam: Not only that, but some other approaches as well. Rhodes: In other words, things that are classified? Ulam: A little bit. Talking about the A-bomb you know. I don’t know how classified it is—nothing terribly important. I can’t tell. Rhodes: Did the H-bomb depend on the development of the computer? Could it have been done? Ulam: It could have been done. Ulam: It could have, in fact all these calculations which Edward and I had done and then Fermi and I wrote the paper on the H-bomb technology—not so much the technology but the problem of how it works and then the actual proposal to do a [inaudible] differently, [inaudible] was realized physically. Could it have been tried without the computer? [Inaudible]. There was no assurance anyway 100% it could have be done. Now all of these modifications, changes, perfections in size and so on—this was [inaudible]. Rhodes: The calculations were important for that. Ulam: Even for A-bombs, the same thing. You couldn’t make miniature. Rhodes: Except a slow version that was represented by the water boiler, I was thinking. Ulam: Well of course, it would explode but it would not be important from the military point of view. The radiation—you would have accidents. Rhodes: Right, the Louis Slotin incident and so forth. You couldn’t even do that with the H-bomb. Ulam: Of course there were computers, namely at first these card machines. Then there were IBM computers, very primitive in the modern sense. You could always calculate it; it would just take much, much more time. But the calculations were possible approximations. Rhodes: That was the work by hand. Ulam: Fermi and I helped with most of the work done by hand applications and with that machine. Rhodes: And in fact during the war, you called the people computers, right? Ulam: Oh yes, many. Curiously enough the number of people using computing now is even larger than early on—all those girls. Rhodes: That little machine was just based on a chip. It has a sixteen-character memory that can correct of all lovely things. Ulam: How much does it cost? Ulam: Oh my wife will be—I would have thought it would be $800,000. Rhodes: It has limitations. It has a dot matrix printer, which is not very high quality. But on an airplane when I am flying around I can write. Those calculations that you and Fermi did you described as an important part of the story that has been overlooked—is there anything you can say about them what they were? Rhodes: Do you know that the article that Dr. Bethe published recently that had been classified since 1954? He describes several approaches. Ulam: Yes. He calls them A, B, C, D, or something. Rhodes: Are your calculations related to those? Rhodes: There is one that is called the Alarm Clock. Ulam: Yes. That is a different model. It’s just name. Rhodes: It is? It’s just a name? It doesn’t refer to a principle? Rhodes: Well as long as we are going on here I’ll ask you these other things. If these are classified, you will say so of course. Ulam: Yes. That I don’t know. I think I’ll be cautious. Ulam: I don’t know. What can I say? I don’t know. Ulam: Well this I tell you. He loved to make drawings. I mean Gamow. And Oppenheimer was an angel of peace. I think Gamow tried to make fun of his attitude towards the whole problem. There was a committee, a family committee to run the whole project of the H-bomb of which each we were member. I think only [inaudible]. Teller was to be the chairman of this committee. “It’s a symbol of the Romba.” That’s how he pronounced it. Ulam: Every time I see it I am reminded. But he was a most amusing person. But no, this is a caricature. Rhodes: It seemed to me that it was possible he was representing your invention here. Ulam: No, this is before. Rhodes: This was done before that? Oh. Okay. Ulam: There was a committee, which later continued. Ulam: Morland’s book is what? Which one is that? Ulam: Oh yes! You mean the man who wrote the unauthorized article. I don’t think—what happened to him? Rhodes: Nothing whatsoever. The government finally dropped the case. Oh! He now is in Washington. I had dinner with him a few weeks ago. He is working for one of the peace movements. He still goes around with his slideshow. Ulam: Wasn’t he an officer in the Air Force – a pilot? And as such he had access to some classified—? Rhodes: That would have been very illegal. He was able to show sources. In fact, the primary source was a drawing in the Encyclopedia Americana along with an article by Teller. Teller professes never to have seen the drawings, which is probably true. But it showed radiated couplings and the primary, the secondary, it all looked enough like this. Ulam: No, not at all. This was done quite a bit before. Rhodes: How fun it would have been. Oh. Ulam: This young man, speaking of the detective work, just as a little] remark in my trip from Paris to New York and I had to wait a long time for a plane in New York to go to Denver. And one of the gentleman with a hat, which very few people wear now, he was a nice looking fellow and we got to talking and he told me that he was a detective, a private bureau. Then he started talking about the literature, Sherlock Homes of course and then I tried to make jokes and say, “Well maybe I will try to be a detective.” And he had two small suitcases, that size I think, and one of these things on wheels which ladies use. And indeed he showed me. He was a collector of old books and files. And I happened to like [inaudible] but he was using something very heavy for something small and trivial. Yes. Rhodes: If it’s possible within the confines of security I would like to say – I’d like to clarify as much as possible what happened about your part in the H bomb invention and Teller’s part. You’ve told the story, he’s told the story. Carson Mark was apparently involved. Ulam: Well he knows everything, doesn’t matter. But two things were published, written up in the same report. The same report which contains a description of the first, well subsequent nature of the principle. Jointly written by Teller and me. It is a joint report. Rhodes: Was Freddy [Frederic] de Hoffmann involved in that same report? Ulam: No. That was later. That was later. Rhodes: So when you had your idea, you said in your book you first went to Dr. Mark? Rhodes: And it wasn’t until the next day that you talked to Teller? Ulam: Bradbury and then next day I spoke to Teller and then both have discussions and we wrote it in two parts. Rhodes: Was yours more abstract and Teller’s more mechanical and specific? Ulam: No. It’s hard to say. It’s hard to say. No. They were both proposals on how to do it. Rhodes: Yours led logically into—? Ulam: It suggested yes, this other one very much. Rhodes: And according to Bethe there was something else, which has always been mixed in and confused with this business, which is the booster-principle, which came much earlier. Ulam: Yes. That’s right, before. Rhodes: Yours was the true Mike-1 bomb? Ulam: Yes. Right. Mike was after. Rhodes: Did Mike test the principles and the ideas that you and Teller had devised? Ulam: That’s right. It was a success, even more than people expected. Ulam: Just like the original first bomb, there were all kinds of guesses of the so-called yield, what the equivalent energy to a TNT explosion would be. People made guesses and there was a pool which was won by [I.I.] Rabi. I think I even mention it in the book. And he was guessing 20,000 [kilotons] or something. It was a joke, but he was trying to be polite because he wasn’t working here, he was just visiting. And his book was really very good. It was better than most books. At the age of eighty-five. Rhodes: Has that been published yet? Ulam: I don’t know. I don’t think so. Have you talked to Rabi? Rhodes: No I haven’t. I should. Ulam: He is in New York. Rhodes: Yeah, I went up to Columbia to see Fermi’s laboratory there. The whole Cyclotron is still there. The pieces of it are still there. I have been all over. Ulam: A long time ago. It is hard for me to realize that much time passed, you know? Sometimes I forget my own age. I think “Oh it is long, long, ago thirty years ago,” I say to myself. No. It was forty or fifty. You will see. Rhodes: I was born in 1937 and I just had my forty-sixth birthday two days ago, so. Rhodes: Child? Yes, Dr. Wigner said that too. Ulam: Oh he did? But he is still older than I am. Good eight years or ten years older. But he is okay physically. Rhodes: He is. He is very spritely. When you think about working, his desk is piled high, like all your desks. Ulam: Maybe he is blessed. Well as you said still, I still play tennis but not any worse than ever really because I play it a little more. I played very little in my life, sporadic. And the last two years I play twice a week. That shows that even at an advanced age if you practice something you can still even improve. Very curious. If you are lucky enough to be in average, normal health. Rhodes: Could you tell me about the business of Fermi saving Teller’s soul at that time, when you went—? Rhodes: Because it made Teller seem like a hero? Ulam: Teller as hero, yes, which, of course, Teller was crucially important but the way it was presented irritated Fermi. I don’t know what Fermi said to him, but he obviously made it as a joke. But he wanted to persuade Teller in this conversation to—of course I don’t know what they discussed. Perhaps [Emilio] Segrè would know. Rhodes: I asked him and he told me about it too he was there at the time. Apparently he actually sat in on the discussion. I was just curious what you thought Fermi meant by save his soul. Ulam: He meant change his whole attitude towards the publicity for the activities connected with the H-bomb. Ulam: Perhaps. It was a half-hearted attempt. Rhodes: It didn’t turn out that way. Rhodes: Well Segrè said, “However, I don’t think Teller understood what Fermi meant.” He took it to mean that Fermi was sympathizing with Teller for his problem. Ulam: Teller thought that? Or made it that way. Too bad. The whole thing is too bad. Rhodes: Yeah, those two or three years were very sad years for everyone for science. I keep picking up the feeling that Fermi quantified almost everything that he could. Was that for his amusement or was it a way of thinking about things? Ulam: Partly for amusement I would say. He had a great gift of being able to estimate things without making detailed calculations. He tried to foster such talent with other people. Perhaps you were with somebody else, he would say at the meeting “Oh try to guess how many locomotives are in the United States for trains” or things of this sort. This was an amusing game but in physics itself it was the most important because nowadays people are trained as physicists and some complicated equations and techniques and if you ask a quality, or an important question, “How does the whole thing work?” They wouldn’t know. I think maybe I mentioned in the book that modern physicists [inaudible]. And then some one of the professors asks them to write the equations of a simplified mode of a moving a rocket without any details of the principal and he couldn’t do it. He knew the computations but he didn’t have the true sense of a physicist and the common sense of reasoning [inaudible] phenomena. That unfortunately is almost widespread now the mathematics the corresponding thing too. Part of it is due to the fact that people don’t know enough history of physics and mathematics. Rhodes: Yes. I am amazed. I talked to a young physicist a couple of years ago he had never heard of the Manhattan Project. He had never heard of J. Robert Oppenheimer. Ulam: Such is fame. In a way, it’s consoling. Probably, you mean he had a degree? Rhodes: He worked at an institute in Kansas City where I live. He was born after 1945. He just never encountered the whole history. Ulam: I went to a meeting in Istanbul, mathematical physics and there was an expression of the [inaudible]. Next to me was [inaudible] and there was one sort of dark skinned, really handsome young man who engaged in conversation and I asked where he was from he said from Madagascar. I said oh you have this marvelous minerals, rare earths. Suddenly he says “Oh yes, you should know it, Dr. Ulam.” He knew my name. Rhodes: I have published eight books and I very seldom find anyone who is alert to that fact. Did you have much contact with Lewis Strauss? Ulam: Not too much, no. I saw him a number of times. Rhodes: He is an enigmatic figure tucked away in the background of all those years. One of the things that I am curious about is whether he was a sort of patron to von Neumann. He seems to have been to Teller. Ulam: He liked von Neumann and was one of the people or the person who was instrumental in persuading him to learn to accept the post in the commission [the Atomic Energy Commission]. Rhodes: Was that in any sense a reward for anything? Rhodes: I didn’t mean financially, but I mean personally. Ulam: Personally, no. The thing that impressed [inaudible] was that he, being foreign born, was given a high government post. But he made jokes to me he said trying to make fun of himself [calling himself] commissioner, “commissioner.” Sometimes in France was sometimes the name of a person who carries baggage on the front of the train. There used to be such people. You are too young to remember. Rhodes: Well what I am thinking of in terms of rewards: Strauss seems to be one of the people that pushed very hard for the H-bomb. Rhodes: Von Neumann took that side that the H bomb should be built, as did Teller and the others. I was thinking of it in that context. Ulam: That is probably true. Do you know the name [William T.] Golden? What is his first name? He was a very important banker or financier who was one of the advisors of Truman. And this might amuse you: about a year ago in Princeton there was [a meeting of] people who were sort of involved in Truman’s decision. I was [inaudible] and among them was Mr. Golden but there was other people—McGeorge Bundy was there, he is writing a book by the way. Well you could get the videotape they made—Sloan Foundation. Sloan Foundation made videotape but they may have much more than that. Rhodes: They have the transcript too. Ulam: Yes. About the history of that. Mr. Golden was there. General [Kenneth] Nichols was there. Rhodes: Did you find [Lewis] Strauss a pleasant person to be around? Ulam: Not unpleasant, not unpleasant. I mean, personally. I can imagine any one of us being unpleasant to somebody else under some certain circumstances. But, I had no, no way of thinking he would be unpleasant, just like [J. Robert] Oppenheimer. I could not personally, but he apparently was on occasion unpleasant in conversations it appears. Copyright 1983 Richard Rhodes. This transcript may not be quoted, reproduced, or redistributed in whole or in part by any means except with the written permission of Richard Rhodes. Exclusive rights granted to Atomic Heritage Foundation.